In Slovakia we were in a few places before we went to the Tatra and the Raj. On the right you see the Beckov fortress. 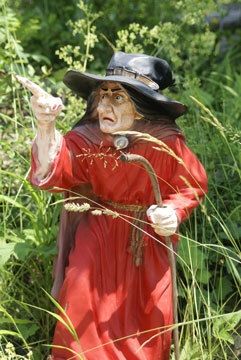 This is one of the first things we saw in Slovakia, just after we crossed the border. The ruins lie on a cliff, about 70 meters above the valley of the river Vah. 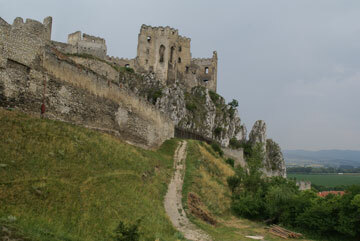 You can find ruins like these all over Slovakia. We didn't give the ruins a very good look, because of the thunder storm coming our way. We were back in our car just before the first drops. The column below is a Trinity column. It represents the Holy Trinity: father, son and holy ghost. 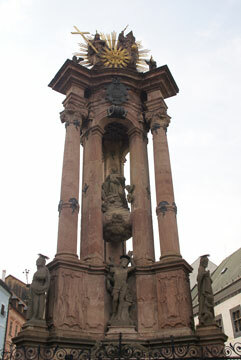 You can see columns like these in many places in the Czech Republic and Slovakia. 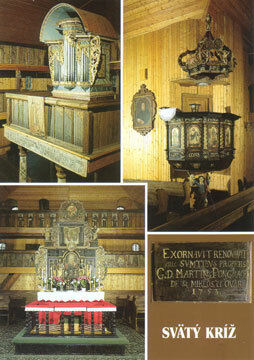 This one we saw in Banská Štiavnica. On several places in the city you can find reminders of the mining past. We liked the museum in the city, with lots of mining tools and examples of minerals. 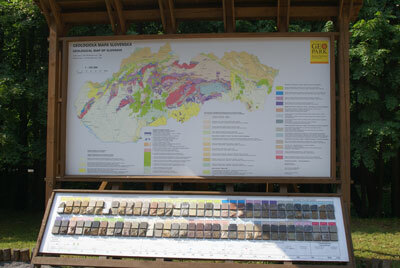 The open air museum is also nice, especially the geological map. 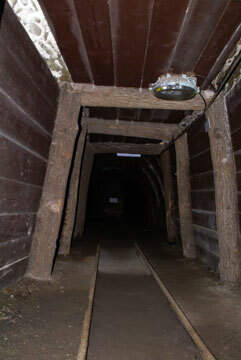 There is also a tour to a real mine, but thanks to a misunderstanding we didn't take that. Well, we have seen a mine before. 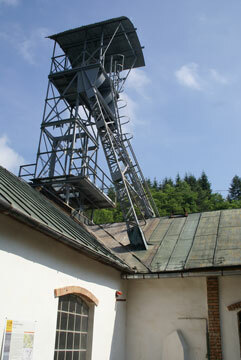 Banská Štiavnica was an important mining town in the Middle Ages. The mines produced more silver and gold than most European countries together. A place you can't pronounce (or at least: we can't), is Vlkolínec. The name means something with wolves, so we call it like a village in the Netherlands, Wolvega. 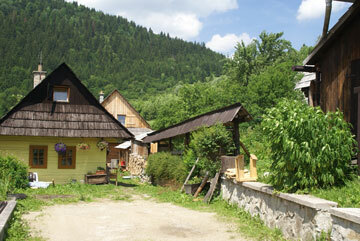 This is a typical Slovakian village, with typical Slovakian village-architecture. A lot of wood is involved, and hardly any nails. 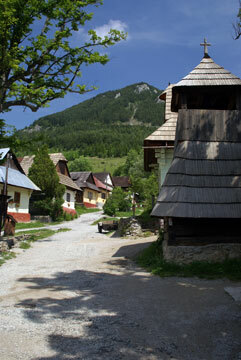 The whole village is placed on the World Heritage list of Unesco. You have to pay entrance to visit the place, but it prevents people from putting their car in front of their houses. This way, you have a good view of the main street with the wooden bell tower and a small stream running through it. In 1982 the Liptovská dam was finished, filling the valley behind it with water. 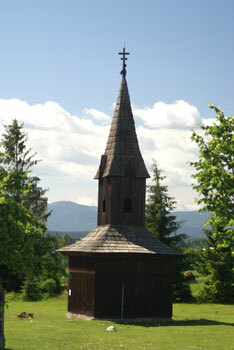 One of the buildings that would disappear in the water, was an Evangelist Church, the Svätý Križ. 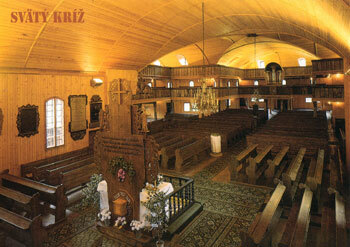 It is one of the biggest wooden churches in Europe, giving place to 6000 people. situated in the middle of nowhere. Sometime in history the bell tower was allowed after all, but the rest of the rules are still valid for this church. 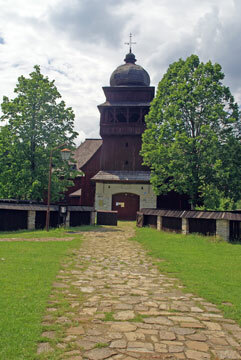 Other buildings from villages that would disappear into the lake were rebuilt in the open air museum in Přibylina. Here lies a complete village, situated in beginning of the 20th century. Not only the houses itself are here, but also the interiors are complete. 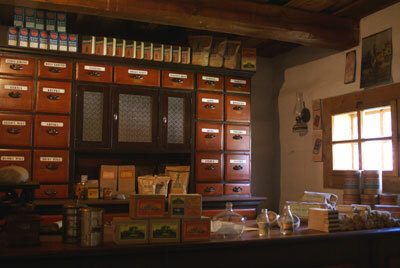 There are not only houses of farmers and labourers, but also a school, a grocery (with a section for liquor) and a bar. In the museum is a church as well, but of course that is the Roman Catholic one. 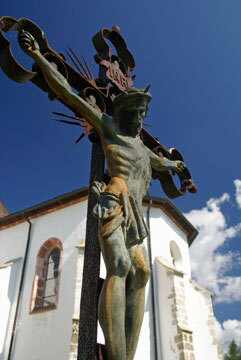 The crucifix is an expensive one: normally they are flat with a painting.